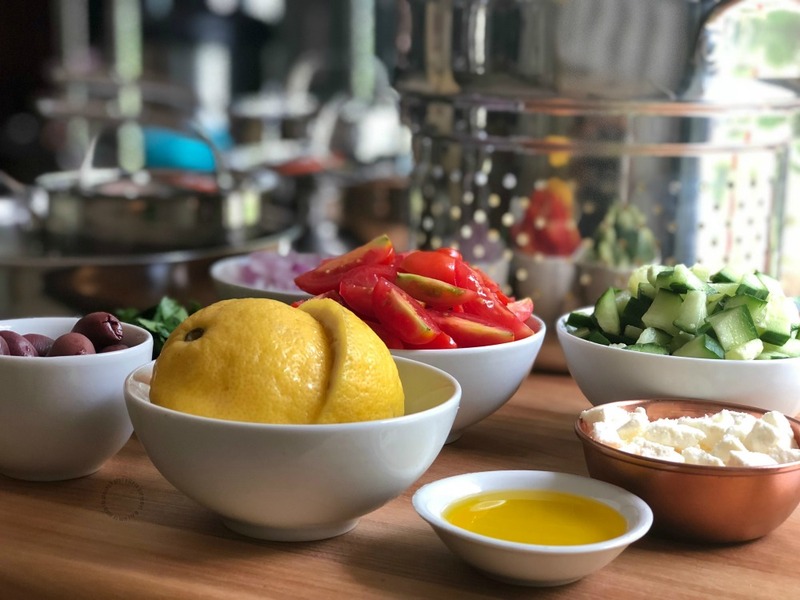 Celebrating family and the flavors of the Greek Cuisine cooking Farfalle Pasta Salad Greek Style! This farfalle pasta salad is a sponsored collaboration with Lagostina. A brand dedicated to manufacturing cookware with high-end design, showcasing the latest innovations, and quality craftsmanship. 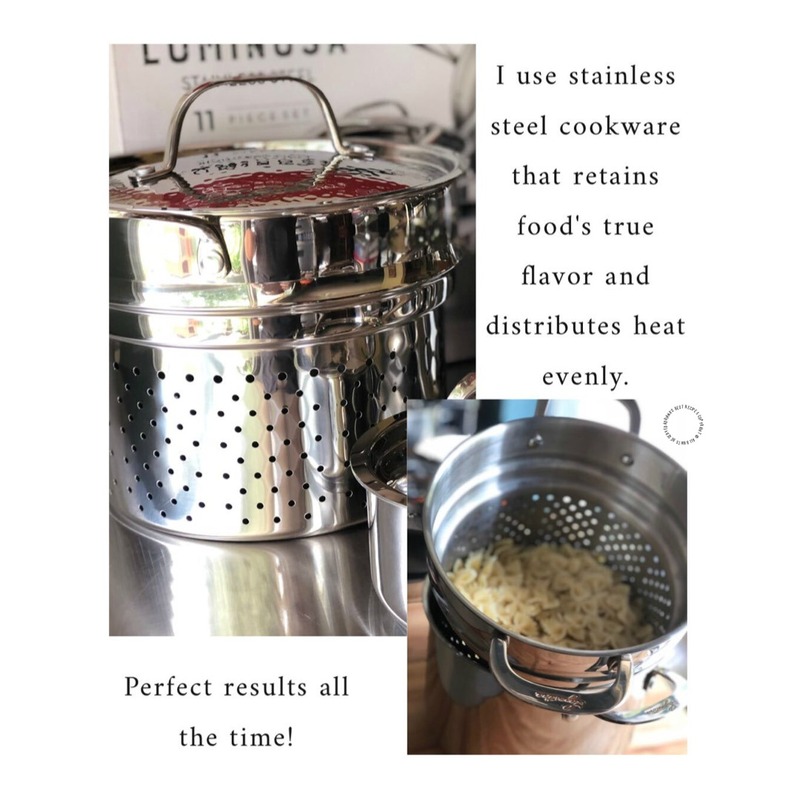 The Lagostina cookware is designed for longevity and is the perfect tool to get the job done while looking beautiful on any cooktop or dining room table. Same as you I sometimes get overwhelmed trying to figure out what to cook for dinner that all the family will love. Family dinners on a Sunday are a tradition at the Martin’s. For those dinner meals, I try to choose something that is not complicated and that can be cooked fast. 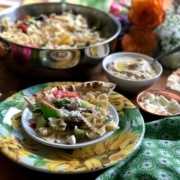 And this farfalle pasta salad inspired the flavors of the Greek cuisine fits the bill. This recipe uses simple ingredients that I can find easily at the supermarket. And in some cases some of this ingredients I already have available in my pantry and the fridge. 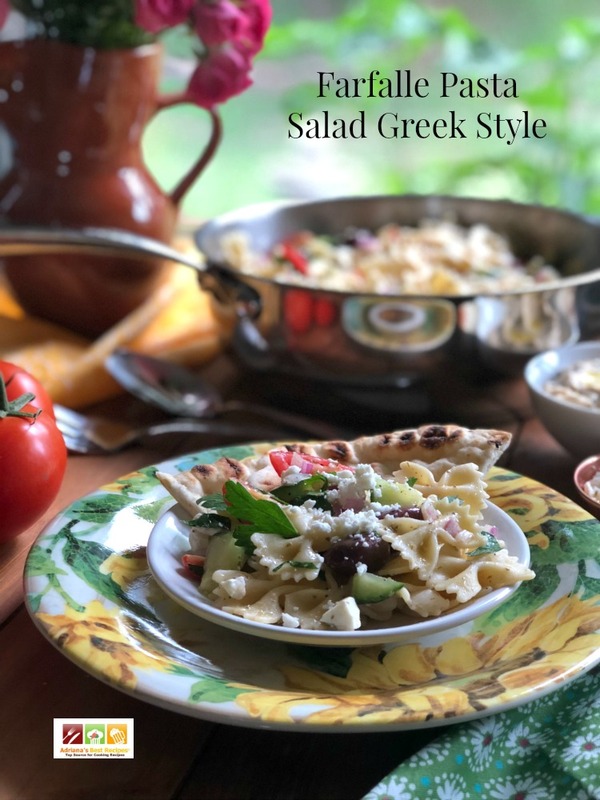 The farfalle pasta salad Greek style is a perfect starter to a family dinner. You can pair with store bought pita bread and garlic hummus. Then fire up the grill and add chicken or lamb kabobs for a complete Mediterranean feast. The farfalle salad you can prepare ahead of time too. Watch the video and get the step by step recipe details! Using proper cookware provides the best results! 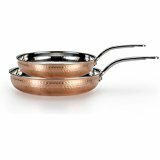 I like to use good quality cookware that is not only beautiful and stainless steel to retain food’s true flavor. But that includes a bonded base to quickly and evenly distribute the heat. This little detail makes so much difference. Cooking on pot and pans that do not distribute heat correctly cause food to burn. Plus food has to taste the way is expected and not with transfer flavors from the pot or skillet you are using. Using proper cooking tools assures perfect results all the time. 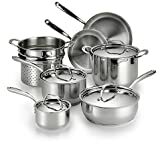 If this is your first time acquiring a cookware set or want to upgrade, consider Lagostina. They have so many different options, all beautiful and crafted with the highest quality. 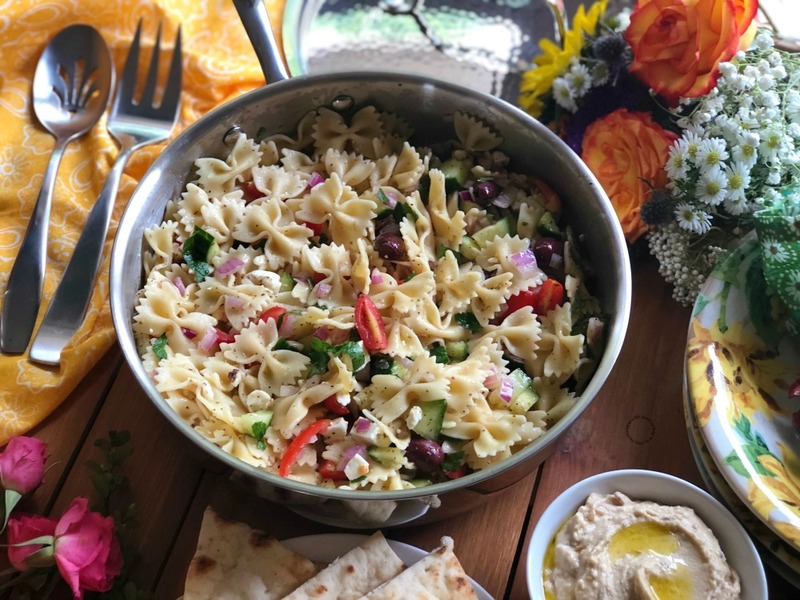 The farfalle pasta salad Greek style is a perfect starter to a family dinner. This recipe is made with mini farfalle pasta, cherry tomatoes, purple onions, seedless cucumber, purple onions, feta cheese crumbles, fresh parsley, kalamata olives, lemon juice, olive oil and Greek seasoning with black pepper, dried basil, oregano, thyme, marjoram, garlic powder and salt to taste. Cook the pasta following the instructions on the package. We are using mini farfalle but you can use a standard size. Add a pinch of salt and some cooking oil while the cooking process. Temper the pasta with cold water when cooked and keep it at room temperature. Chop all the ingredients and add to a skillet. Combine with the olive oil, the lemon juice, and the seasonings. Mix well and add the cooked pasta. Incorporate the pasta with the rest of ingredients and garnish with crumbled feta cheese. You can add salt to taste and additional lemon juice if desired. 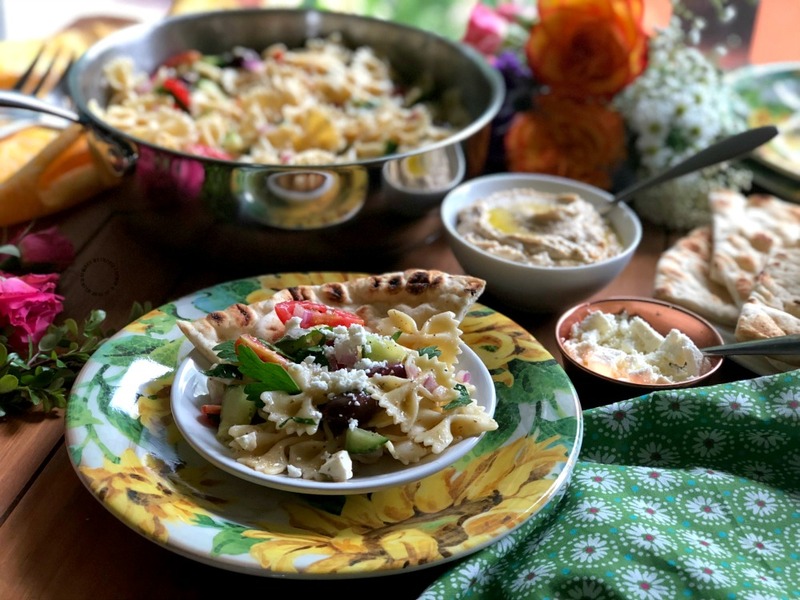 Pair the farfalle pasta salad with hummus and pita bread. You can add grilled meats or kabobs for a complete meal. 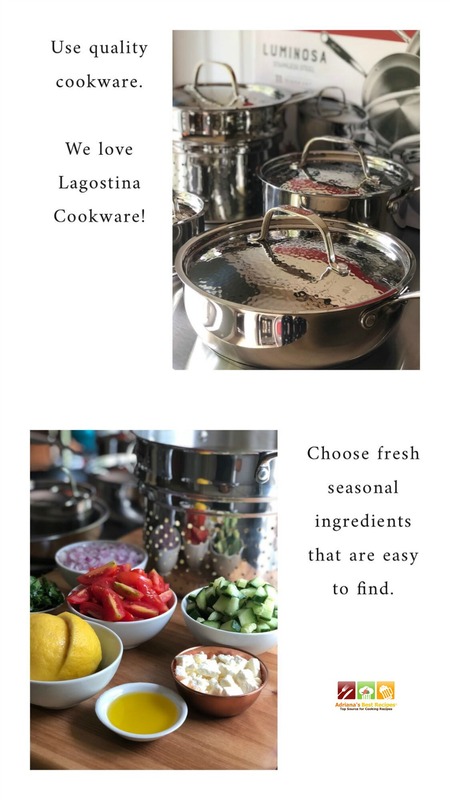 Use Lagostina cookware for best results. Looks so delicious and perfect for dinner or a quick lunch! What a gorgeous set of cookware – and speaking of gorgeous – this pasta salad looks so good! This looks like the perfect summer salad. Fresh flavors and healthy too! I love fusion food and Greek Pasta is one of my favourites. This looks delicious. Wow, that cookware is gorgeous and so is that salad! I love all things Greek and this pasta salad would be perfect for my work from home lunches! I’m always looking for more ways to add veggies to our lunches and this is a perfect recipe to do that. I love the greek salad twist on pasta salad! Such a clever – and tasty – idea! This looks so delicious! It’s perfect for Sunday dinner with the family! This is so fresh, perfect for summer meal. Lagostina cookware is a great choice for any kitchen. Yum! Your photos are beautiful. I would love some of this pasta salad. I love Greek salads and this is one beautiful salad that’s full of veggies! Those pans are gorgeous and I couldn’t agree with you more. Having a good set of cookware makes all the difference. I love pasta salad and often make it with farfalle too. The Greek flavours here are such a good idea! This looks delicious and perfect for a summer BBQ or a weekday lunch. Thanks for sharing!